FILE - Early German-language VOA broadcaster, Robert Bauer. A little more than seven weeks after the United States officially entered World War II, a live, 15-minute shortwave radio broadcast was transmitted into Germany from a small studio in New York City on February 1, 1942. 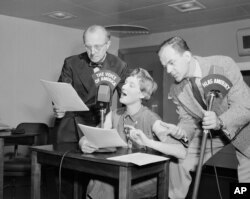 That was the very first broadcast from what, 75 years later, is now the Washington-headquartered Voice of America. By the end of the war, VOA was broadcasting in 40 languages, with programming consisting of music, news and commentary. VOA is celebrating its 70th anniversary. Here is a look at VOA's early work and facilities, in the studio and in the field. Since then, VOA has grown into a multimedia international broadcasting service, with programming and content in 47 languages on multiple platforms, including radio, television and mobile. On that first broadcast, announcer Hale's words set the standard for future programs. FILE - Three former residents of Czechoslovakia tell Czechs how communist leaders of that country sent Associated Press correspondent William N. Oatis to prison through the Voice of America, September 6, 1951. Over the years, VOA correspondents and freelance reporters in many parts of the world have been on the scene to cover major world events. In 1989, VOA East European correspondent Jolyon Naegele reported on demonstrations in Czechoslovakia and the fall of the communist government. Later that year, on the other side of the world, VOA increased programming and added staff to its Beijing bureau to cover the student-led demonstrations in Tiananmen Square. Beijing Bureau chief Al Pessin was expelled from China for his reporting. Today, VOA broadcasts news and other programming through 2,500 television and radio affiliates around the world. At the same time, it provides content for mobile devices and interacts with audiences through social media. Check out more information on our VOA 75th anniversary page.